Buy Cheap Warhammer 40k Orks Models Now, Get 20% Discount Off RRP - Free Royal Mail 24 UK Delivery Over £75 - Same Day Dispatch In Stock Orders! Designed for pure speed, it eschews the usual Orky technique of nailing every single bit of metal in the area to a vehicle – you have the option of assembling it without even the roof, exposing the roll cage. Attached to the frame is a network of exhausts and intakes that feed the enormous, powerful engine mounted in the front. 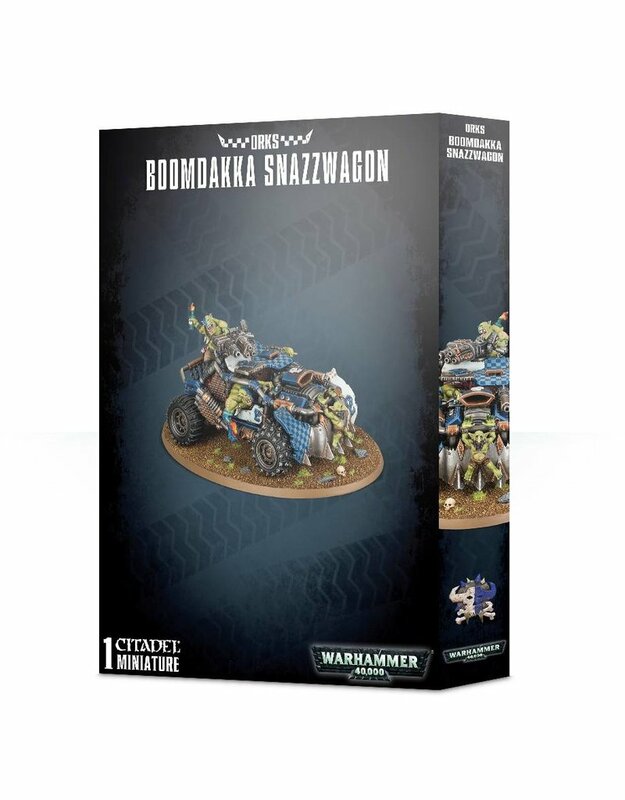 As well as this engine, the front of the Snazzwagon features a massive dozer blade, with a masked Grot tightly strapped on – as if that weren’t enough manic detail, there’s a mek speshul mounted to the left side of the main air intake. The driver is leaning out of the right-hand side, leering ahead with a burna bottle ready to go, while riding shotgun is another Grot, this one waving a blasta. A bellowing Burna Boy balances on the back, burna bottle in one hand and the trigger of a big shoota in the other.